Gerald Nosich outlines some basic strategies for getting students to think critically about historical questions. Good for all history-based courses. Topics include: what are the real reasons for teaching history?, the value of “living in the past,” four basic historical questions, discovering our misconceptions of the past, and strategies for teaching students to think critically about the past. 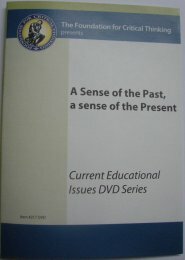 317DVD A Sense of the Past, a Sense of the Present (DVD) $9.95	 Qty.